Goal I: To bring about in all Catholics such an enthusiasm for their faith that, in living their faith in Jesus, they freely share it with others. Goal II: To invite all people in the United States, whatever their social or cultural background, to hear the message of salvation in Jesus Christ so they may come to join us in the fullness of the Catholic Faith. Goal III: To foster Gospel values in our society, promoting the dignity of the human person, the importance of the family, and the common good of our society so that our nation may continue to be transformed by the saving power of Jesus Christ. Building on Paul VI’s understanding of evangelization, Pope John Paul II called for a “new evangelization” that is an evangelization that is new in ardor, methods and expression. The new evangelization must deepen the faith of Christians, forge a new culture open to the Gospel message, and promote the social transformation of the world. Goal I: To bring about in all Catholics such an enthusiasm for their faith, that, in living their faith in Jesus, they freely share it with others. Believe – Encourage all Catholics to experience conversion to a deeper holiness and a greater love of God. Goal II: To invite all people to hear the message of salvation in Jesus Christ so they may come to join us in the fullness of the Catholic Faith. Share – Welcome and invite others to learn about and share in the Catholic Faith and encounter Jesus Christ in the Sacraments. Goal III: To Foster Gospel values in our society, promoting the dignity of the human person, the importance of the family, and the common good of our society, so that our nation may continue to be transformed by the saving power of Jesus Christ. Transform – Change society with the power of the Gospel. 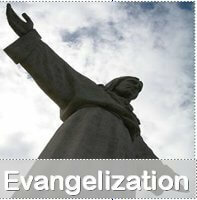 These three goals constitute the thrust of evangelization of the Catholic Church. In implementing these goals, we strive to fulfill the mission of Christ through the Church which is the reason that we exist in the first place. 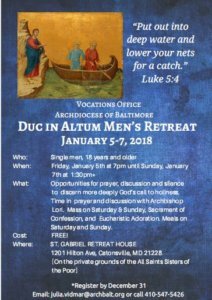 We are here to listen and connect you with Catholic resources and opportunities throughout the Archdiocese of Baltimore.